This is the mark of a true professional. 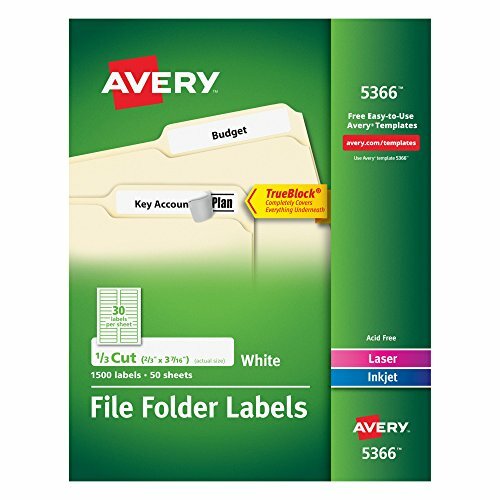 Use these White File Folder Labels with True Block Technology to give ordinary folders a clean, organized look that's easy to identify. These innovative labels are designed to completely cover everything underneath, from markings to old, existing labels. Plus, these labels are guaranteed to stick and stay, without curling or lifting. And with free templates you can put smart label design in plain view, or add your own custom colors to create your own filing system. Simply type in text to identify folders or documents. After printing with a laser or inkjet printer, you'll have professional-looking labels that you can spot right away.